Hey, Watch the Sand, Man! Your neighbor, who also came to enjoy the day, thought your head was the best spot to shake off their towel. No matter what beach you go to, with a little Beach Etiquette, we will preserve its beauty and pay it forward. I think you will like it. It is a funny take on some of the things you see or experience on the beach and what is the proper etiquette of the beach- Have you ever thought should you let you one year old kid run around naked on the beach or could you sit in the water with your beach chair? How about rinsing your feet off before you come into the house? Wait to you read it and allow yourself to chuckle. This book has a special place on my coffee table at my beach house for those unknowing visitors that come for a weekend without bearing a gift. It is worth the price of buying just for that little nudge! George, the book is easy to read and spot on. I love the pictures, they are rather fun. Just in time for Summer 2018!! I loved the illustrations! And the observations... How many times have we all experienced these situations and wished there were a book of rules for inexperienced beach goers. Well here you go! My wife and I read your book and really enjoyed it! It has so many of the things that we’ve all thought about at the beach over the years but never put in print. I’m putting it on my coffee table in Sea Isle for everyone to read. Great job! My wife was laughing the whole time she was reading it. Keep on rolling - this is a great piece. I want to start out by saying I am a big fan of the beach. I have been going to the Jersey shore since 1956 and have many fond memories of running, playing in the sand, body surfing, surfing and just relaxing on the beach. If you are looking to kick back and relax, nothing beats a day on the beach. Some people say the shore. You actually drive to the shore and then you walk to the beach. 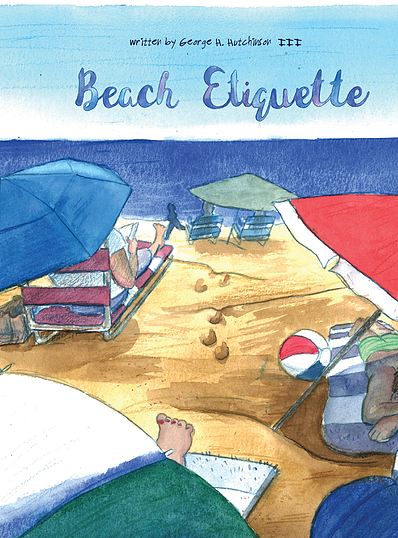 What follows are a few simple rules I call beach etiquette that will allow you to enjoy your day just a little bit more.